WASHINGTON, D.C., December 5, 2018 – A new report finds that inequalities in access and eligibility for employer-sponsored retirement plans produce persistent retirement savings gaps for Latinos. As a result, Latinos are falling behind in preparing for retirement. Only 31 percent of all working age Latinos participate in workplace retirement plans, resulting in a median retirement account balance equal to $0. These findings are featured in new research, Latinos’ Retirement Insecurity in the United States, from the National Institute on Retirement Security (NIRS) and UnidosUS. “Most Americans are far off-track when it comes to preparing for retirement, and this report offers an even grimmer outlook for Latinos. 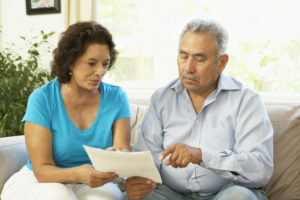 The retirement divide can begin to close if more Latinos have access to retirement plans and are eligible to participate,” says Diane Oakley, NIRS executive director. “State-sponsored retirement plans that are taking hold across the nation also can play a big role in improving the retirement outlook for Latinos. Such plans target working Americans who lack access to employer-sponsored retirement plans, and less than half of Latino employees in the private sector have access to such plans,” Oakley added. “The latest data in this report reinforce the persistent barriers to retirement readiness facing Latinos. 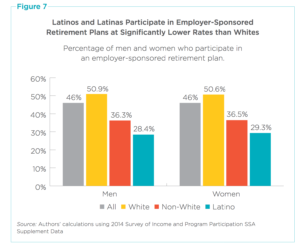 What is particularly concerning about the report’s findings is that, while Latino workers have the highest rates of take-up when offered and eligible for a plan, they have the lowest rates of access to a retirement savings plan. It is critical, then, that we work to increase Latinos’ eligibility, along with their access, in order to increase the number of Latinos that could save for retirement in employer-sponsored plans,” said Samantha Vargas Poppe, director of the Policy Analysis Center at UnidosUS. Access and eligibility to an employer-sponsored retirement plan remains the largest hurdle to Latino retirement security. The retirement plan participation rate for Latino workers (30.9%) is about 22 percent lower than the participation rate of White workers (53%). When Latinos have access and are eligible to participate in a plan, they show higher take-up rates than other races and ethnicities. Expand Plan Eligibility for Part-Time Workers. The top reason Latinos did not have retirement savings was that they worked part-time. Allowing part-time workers to participate in employer-sponsored retirement plans would greatly increase the number of Latinos that could save for retirement. Promote the Saver’s Credit. The Federal Saver’s Credit is a non-refundable income tax credit for taxpayers with adjusted gross incomes of less than $31,500 for single filers and $63,000 for joint filers. Given that the median household income for Latinos was $46,882 in 2016, a large number of Latino households would qualify for the Federal Saver’s Credit if they saved for retirement. By widely promoting the credit, many more Latino households could be rewarded for saving for retirement. Promote and Further Develop State Retirement Savings Plans. In 2014, an estimated 103 million Americans between 21 and 64 lacked access to an employer-sponsored retirement account. In response to this gap, a number of states have enacted state-sponsored retirement savings programs that automatically enroll individuals in a plan if they are not covered by an employer-sponsored plan. For Latinos, state plans are especially important. State retirement savings plans can provide low-cost retirement products to working Latinos who are not covered by a workplace retirement plan, thereby helping to alleviate the current retirement savings crisis that Latinos face. Latinos lead population growth in United States, accounting for 17.8 percent of the total U.S. population and numbering over 57.5 million. As the largest minority group in the U.S. workforce, Latinos comprised 16.8 percent of the labor force in 2016. The U.S. Census Bureau estimates that by 2060, the Latino population will number 119 million and will account for approximately 28.6 percent of the nation’s population. Additionally, the U.S. Administration on Aging predicts the Latino population that is age 65 and older will number 21.5 million and will comprise 21.5 percent of the population by 2060. This report updates and builds upon a 2013 report, Race and Retirement Insecurity in the United States, and is based on an analysis of the 2014 Survey of Income and Program Participation (SIPP) Social Security Administration (SSA) Supplement data from the U.S. Census Bureau. The report examines the disparities in retirement readiness between working Latinos aged 21 to 64 and other racial and ethnic groups.